The town spent millions of dollars renovating and upgrading the facility, which features diamonds that are replicas of famous baseball stadiums. GILBERT, AZ — With Spring Training a mere week away, baseball fans in Arizona will have a chance to sit inside Chicago's historic Wrigley Field or see the scoreboard of Chase Field, home of the Arizona Diamondbacks, or perhaps munch on a pretzel while looking out at Angel Stadium, or the old Sportman's Park. And it's all in one place. 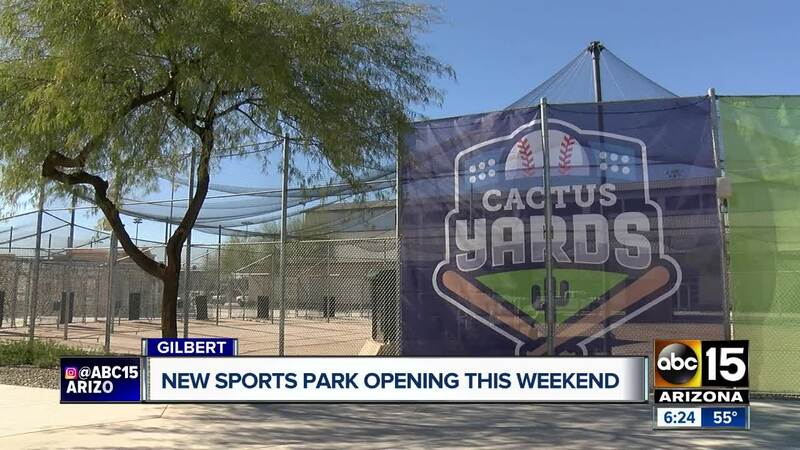 On Saturday, Feb. 9, the Town of Gilbert will host a grand opening event for "Cactus Yards," the town's newly-re-branded and renovated sports facility and park near Power and Elliot roads. The free event will take place between 4 p.m. and 8:30 p.m. The facility, which was built in 2007 and opened in 2008, has eight replica baseball fields that will be home to youth baseball tournaments, and adult softball and kickball leagues. A 20,000-square-foot field house boasts an indoor soccer field and concession stand, batting cages with slow and fast pitch options, and a playground. "I think it is going to be a big draw for the youth, so they kind of get that feel in the big leagues," said Dan Wilson, recreation supervisor for Cactus Yards. "They get a chance to play on the fields and replica stadiums and I think they'll be really excited." The park's two restaurants have been re-branded. Both are now called "Sliders Sports Grill" and are helmed by Otis Huemmer, the corporate executive chef at Craft Culinary Concepts. 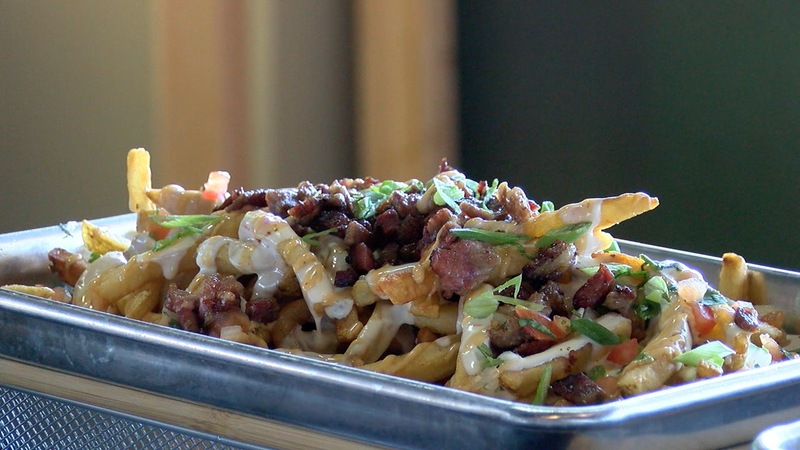 He added a number of large, elevated stadium food dishes, including "Dirty Fries," which are fries topped with brisket bites, Chipotle crema, and white queso; Homerun Nachos, with carnitas, guacamole, melted cheese, and jalapenos; a pulled pork sandwich; tamales from "The Tamale Store" in Phoenix; and a pretzel-crusted pizza. The restaurants have new flooring, paint, TVs, tables and chairs, and counter-style seating along the windows so people can watch the games from inside the clubhouse, said Wilson. In 2017, the town shut down the facility, which was previously known as Big League Dreams and managed by that company, citing safety concerns and structural issues. Since then, the town and Big League Dreams have been hashing out various issues in court. The facility is now owned and operated entirely by the town, which has spent $15 million to renovate and update the facility. The Town allocated $12.8 million to improve the grandstands at the facility, which had code deficiencies; to make the facility more ADA (Americans with Disabilities Act) compliant; pour new concrete around the plaza, and revamp the clubhouse's exterior, according to an email from Jennifer Harrison, digital media and marketing officer for Gilbert. Another $2.5 million was used to repair or renovate the two clubhouse restaurants, batting cages, administrative building, dugout drainage systems, graphics and parking lot, she said. The project will be "about $500,000 under the budgeted amount," she said. Moving forward, the park will be funded through the Gilbert Parks and Recreation budget and from money collected from programs, tournaments, sponsorships and events, she said. On Saturday, the grand opening event includes a concert, skills challenges, appearances from professional teams, inflatables, corn hole and a fireworks display. The opening ceremony and fireworks show are scheduled to start at 6 p.m.